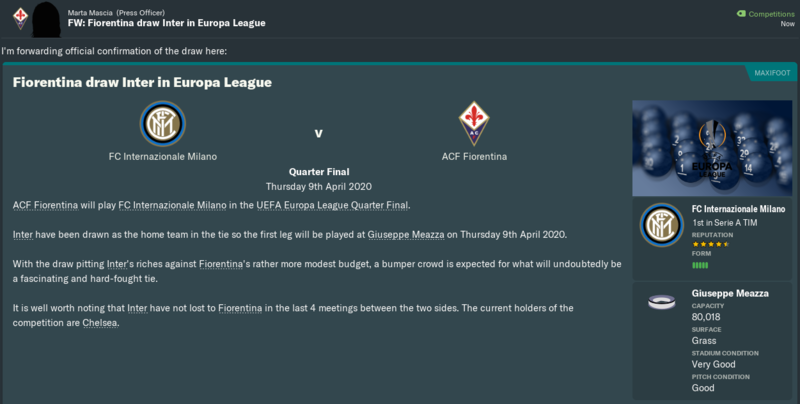 The matches keep coming thick and fast for my Fiorentina team. We’re still fighting on three fronts, but is it possible to reach the Coppa Italia Final, progress to the latter stages of the Europa League AND maintain a top-six placing in Serie A? With a squad that’s perhaps lacking depth? This chapter begins with what looked to be a straightforward home game against an out-of-sorts Parma team. While the Crociati weren’t quite the utter no-hopers they are in The Wide Playmaker’s Fiorentina career, they arrived at the Artemio Franchi dead-last. That’s what collecting two points from six games after the winter break does to you. Mind you, my decision to field a load of fringe players and rest my main men for the Coppa Italia Semi Final nearly backfired. Alban Lafont – one of the few Viola mainstays to keep his place – saved a shot from Parma forward Gervinho in just the 13th minute. Also featuring was captain Germán Pezzella, who was still buzzing after scoring his first goal of the campaign against CSKA Moscow. His second came after 22 minutes, with Riccardo Saponara planting a pinpoint corner onto the Argentine defender’s head. Eloy Room flapped at the header, but there was plenty of room in goal for the ball to fly into. Room did keep Viola youngsters Emil Antonsen – making his first start for the club – and Dusan Vlahovic off the scoreboard later in the first half. The Dutchman’s save from a 38th-minute volley by Vlahovic was especially impressive, prolonging Dusan’s wait for his maiden goal this season. While Vlahovic seemingly couldn’t score, Pezzella apparently couldn’t stop scoring! Our centre-back turned centre-forward again in the 64th minute, nodding in Valentin Eysseric‘s free-kick from a difficult angle to secure a brace! Pezzella got a well-earned rest for the closing stages, with Giorgos Antzoulas making a Serie A debut in his place. With Germán gone, the scoring ended at 2-0, and we claimed an easy home-and-away double over the Crociati. The top four all toasted victories, with Napoli and Milan each moving on to 60 points following their narrow wins over Sampdoria and Genoa. Inter remained four points adrift after a big 2-0 win at Lazio, whose grip on 5th position was loosened just a little. Juventus won 4-1 away to Salernitana, despite their lowly hosts holding them to a draw at half-time. A brace from Ronaldo took him up to 17 league goals for the season – SIX clear of his nearest challengers (Napoli’s Arkadiusz Milik, and Milan’s André Silva). I suspect we already know who this season’s Capocannoniere is going to be. Having won 3-1 at the Franchi last time out, we arrived at the Adriatico for the second leg of our Coppa Italia semi in some comfort. Of course, though, I was aware that a 2-0 Pescara win would send the Delfini through on away goals. Just like in the first leg, Pescara came out fighting from the start. Just five minutes in, Brayan Perea took advantage of some chaotic Viola defending to head home a Gastón Brugman corner and halve our overall advantage. Eight minutes later, a minor concern became a full-blown crisis. Fousseni Diabaté’s fierce shot from outside the area deflected off our left-back Maximiliano Olivera‘s shin and into the six-yard box. Pescara midfielder Pepín popped up to lash a half-volley past goalie Daniele Padelli, and the Delfini now held the advantage. We now had to score, but with Eysseric having one of his off-days, that didn’t look likely through much of the first half. Fortunately, we could always rely on Federico Chiesa. Our right-wing marvel – donning the captain’s armband in Pezzella’s place – outwitted the home defence to head home from an Olivera cross. Our position was strengthened further in stoppage time. Olivera’s free-kick prompted some pinball in the Pescara box before Marco Benassi converted his first goal this term. That made it 2-2 on the night and 4-2 Fiorentina on aggregate, but now we had the edge on away goals. Unless we conceded THREE second-half goals, we could plan for the Final. The first half-hour of that second period was encouragingly quiet, so much so that I benched Benassi and gave 18-year-old midfielder Tommaso Minocci another first-team outing. In hindsight, such hubris was always bound to offend Pescara. The Delfini’s resurgence began in the 80th minute, when veteran defender Andrea Masiello volleyed in Perea’s flick-on from a Brugman corner for a 3-2 home lead on the night. Brugman got his name on the scoresheet seven minutes later, striking from Harlem Gnoheré’s deflected cross to leave us panicking once again. That took Pescara from almost nowhere to the verge of reaching the Final. They just needed one more goal. My heart went in and out of my mouth countless times in those final few minutes, but in the end, we did just enough to edge through on away goals. That was far too close for comfort. Napoli also had a major scare in the second Semi, falling behind Inter on away goals before Arkadiusz Milik’s penalty reduced their deficit at the San Siro to 2-1. That put the Partenopei through 4-3 on aggregate. The 2020 Coppa Italia will therefore be a re-run of the 2014 decider. Fiorentina will play Napoli at the Olimpico on 13 May. You’d better clear your diaries, folks. On Leap Day, I hoped to see us take a giant step forward in our rivalry with Juventus. Defeat to La Vecchia Signora at the Allianz was not an acceptable option, as it would leave us at least 12 points adrift of Serie A’s top four, with just 11 matches left to play. Alas, our worst fears would soon come true, as – not for the first time this season – we badly struggled against Everton. Following a very positive start from the hosts, it was the Brazilian forward of that name who opened the scoring in the 14th minute. After a couple of shots from compatriot Douglas Costa were blocked by purple jerseys, Everton pounced on the rebound with a left-footed half-volley. Things didn’t get any better for us later on. Wantaway midfielder Jordan Veretout was booked in the 21st minute for tripping Gonzalo Higuaín. A little over ten minutes later, Veretout’s counterpart Rodrigo Bentancur doubled Juve’s advantage with an excellent bending shot, albeit one that took a nick off Nikola Milenkovic on its way in. Bentancur was denied a second goal on 36 minutes, with the crossbar keeping out his header from Costa’s hanging-ball corner. At the other end, home goalie Wojciech Szczesny made light work of a couple of attempts from Pietro Pellegri and Pezzella to get us back in the game. The Bianconeri confirmed their dominance in the 61st minute. Bentancur found the underlap of left wing-back Alex Sandro, who drove in a rare goal to send Juventus 3-0 up and compound our misery. A third straight defeat to our most hated adversaries was now a virtual certainty. While a certain Portuguese forward had uncharacteristically gone missing, Juve’s Brazilian aces were pulling all the string. Man of the match Costa would have wrapped up a 4-0 win in stoppage time had it not been for Lafont’s woodwork, which was arguably Fiorentina’s best performer in another sorry display. Juve’s win gave them a sizeable lead on us in 4th place, while also boosting their hopes of a ninth straight scudetto. They were now four points adrift of new leaders Milan, whose 1-1 draw at Roma saw them overtake Napoli, who’d suffered their first home defeat against Lazio. Inter’s 2-0 victory over Pescara moved them within two points of top spot. Though we were still 6th, Torino’s late draw at Chievo and Atalanta’s victory at Genoa had both Il Toro and La Dea breathing down our necks. If we didn’t get back to winning ways, we would surely be out of the European spots before long. Having lost back-to-back matches, the pressure was really on us when we continued our Europa League campaign. Viola fans were expecting nothing less than a comfortable win over Celtic to put us on course for the Quarter Finals. Four minutes after kick-off, we were already on our way. Cristiano Biraghi crossed into the Celtic box from the left wing, and Luciano Vietto cushioned it to his fellow loanee Pellegri, whose powerful close-range strike was his 13th of the season. The teenage striker would have had his 14th shortly afterwards, but the bar kept out his header from another Biraghi delivery. We stormed further ahead in the 24th minute, counter-attacking with surgical precision. Biraghi’s firm slide tackle on Celtic forward Daniel Arzani was followed by an exchange of passes between Pellegri and Vietto as we quickly approached the area. Pellegri’s subsequent square ball was then drilled in by Veretout, who had finally clarified his future less than 48 hours earlier. You never really wanted to leave, did you, Jordan? Celtic then pushed forward in search for a goal back. In the 38th minute, midfielder Callum McGregor sought out Arzani with an excellent long ball into our box. Arzani then dribbled past a couple of defenders before shooting from a tight angle. Although the Australian’s first shot was parried by Lafont, the rebound was headed home, leaving us with just a 2-1 lead at the break. Arzani’s goal spurred the Bhoys on for the second half, and they would surely have equalised had Ryan Christie – another member of their front three – been more accurate with his shooting. Our own attacks also left plenty to be desired… until the final 20 minutes. Chiesa began to show his class in the 73rd minute, smashing in a square pass from Biraghi to reinstate our two-goal lead. The vice-skipper would turn 3-1 into 4-1 just eight minutes later, breaking past a sluggish Celtic defence to complete a devastating breakaway by powering in a cross-field ball from substitute Eysseric. Another sub then put the icing on the cake six minutes from time. Bhoys left-back Sam McQueen had blocked a fierce strike from Veretout, but he could not prevent Saponara from hammering the follow-up past goalkeeper Scott Bain. 5-1 to Fiorentina after the first 90 minutes. Was the tie over already, or could Celtic mount an astonishing fightback in Glasgow a week later? We were now on a run of five straight home victories, and when it was Cagliari’s turn to play at the Franchi, we felt confident of making it six. Mind you, the Rossoblu were also on a high, having recently climbed out of the relegation zone for the first time in months. Such was the influence of a certain Sandro Tonali, who was Serie A’s Under-19s Player of the Month in both January and February. Alban’s goalkeeping adversary also made a big early save, with Alessio Cragno thwarting Pellegri’s 13th-minute header. The two would come face-to-face again in the 21st minute, when Eysseric won a penalty upon being brought down on the byline by Jordy Clasie. Regular readers might recall that Cragno saved a Pellegri corner during these teams’ last encounter in Sardinia. Lightning would strike again on the mainland, with Pietro’s penalty to the keeper’s right being batted away. Cagliari countered a minute later, but their young frontman – North Korean international Han Kwang-Song – somehow screwed Capone’s cross past a gaping target. The half ended with a series of misses from Fiorentina midfielder Emil Antonsen. Neither he nor Pellegri was handling playing well, so both teenagers were subbed after a goalless opening hour. Their more established replacements Veretout and Santi Mina also proved ineffective at breaking Cagliari down, as did Chiesa when he came on for Vietto. Despite bossing possession, we simply could not find a way past Cragno, who was in inspired form. Our own defence also held firm against the Rossoblu’s attacks, to be fair, so a 0-0 draw was perhaps the correct result. Even so, I saw this as two points lost rather than one gained. I had even more reason to be fuming after such a toothless display. Torino’s 2-0 win over bottom side Parma took 6th place from us, and Atalanta would have bumped us down to 8th had they beaten Roma. As it was, they could only muster a 1-1 draw. The title race took another twist when Inter soundly beat Napoli 3-0. That result – combined with Milan’s inability to overcome Pescara – took the Nerazzurri up into 1st position, above their city rivals on head-to-head. Napoli slipped to 3rd, while 4th-placed Juventus toiled to a 2-2 draw at Verona. A week after crushing Celtic at the Franchi, we travelled to Glasgow to finish the job. As long as a reserve Viola team didn’t fall apart like a house of cards, we would be safely into the last eight of the Europa League. An early goal would have settled Celtic’s nerves and put the tie in some doubt. Christie missed a golden opportunity in the second minute, finding the side netting after running onto a cross-field ball from Leigh Griffiths. That was obviously a telling miss, as I noticed some home players feeling anxious or even disenchanted in the early stages. They did not look like a team that believed. The Bhoys’ fears didn’t ease later on, with McGregor messing up a couple of promising shots. Their first shot on target came from Jack Hendry right at the end of the half, but Lafont made simple work of the centre-half’s header. Fiorentina attacks were few and far between, with Berardi looking like the most likely scorer until he bruised his shin in a tackle from Celtic midfielder Tom Rogic just before half-time. Rogic would himself for an ankle injury early in the second half, as would Griffiths. The quality of the match continued to deteriorate as Celtic’s hopes of pulling off an upset diminished further. When substitute winger Lewis Morgan finally found the net from a Griffiths cut-back in stoppage time, it was a case of too little, too late. While the Bhoys had won this battle, it was our men who had won the war, 5-2 on aggregate. Joining us in the Quarter Finals were some formidable teams. Arsenal were there, as were Anderlecht, Benfica, Fenerbahçe, Real Betis, and the two Milan teams. Guess where we would be heading? No, I wouldn’t give up now. If we could get a decent result at the San Siro on 9 April, we would stand a chance of knocking them out at our place a week later. We just had to believe. Alberto Scotta is a physical centre-forward who’s comfortable on either foot. He obviously looks very raw right now, but give him a few years and he could be ready to play for his hometown club. There’s just one potential problem with Alberto, and I don’t know how to say this, but… he’s, er, a Juventus fan. Luckily, Michel Cecci is a die-hard Viola tifoso. 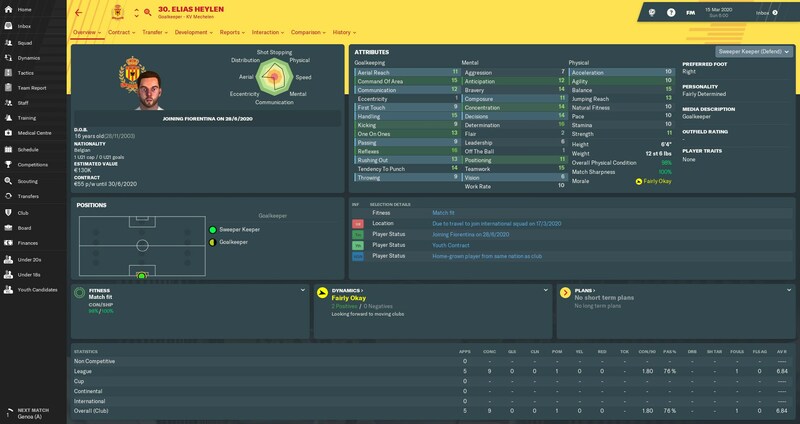 He has a Driven personality (which I love), his technique looks good even now, and he’s got huge potential as an inside-forward on the left. Could we have unearthed the heir to Chiesa’s throne? Even at 16, Elias Heylen has already had some career in his native Belgium. Despite starting out at second-tier Beerschot-Wilrijk, the tall goalkeeper was loaned out to Pro League side Mechelen, who’ve trusted him in a few league games. He also picked up an Under-21s cap for Belgium and caught the attention of one of my scouts. Heylen signed a pre-contract agreement with us and will move to Italy this summer for €800,000 compensation. He and homegrown youngster Filippo Turci (who’s making steady progress in the Under-18s team) will likely battle it out over the coming years to be Lafont’s understudy and potential successor. Before the final international break of the season, we took on Serie A’s draw masters at the Luigi Ferraris. Genoa had tied exactly half of their matches, but a pitiful record of only three wins from 28 had left them in the relegation zone. 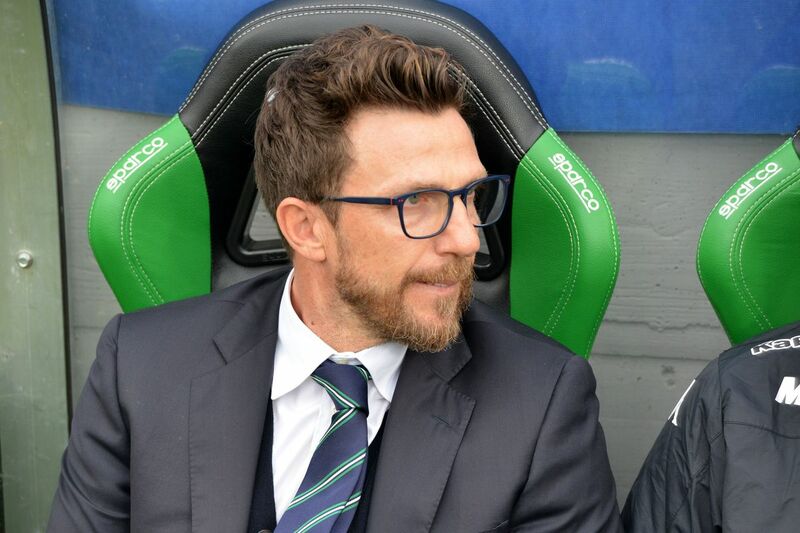 Former Roma chief – and Italy’s leading hipster – Eusebio Di Francesco was now in the manager’s hotseat. The action switched back-and-forth between both halves in the early stages, with both goalkeepers having plenty of work to do early on. The officials’ first major test came in the 24th minute, when Krzysztof Piatek volleyed Tozé’s chipped free-kick into Lafont’s net. The Video Assistant Referee was consulted, and it was ruled that Genoa’s Polish striker had strayed fractionally offside. No goal. VAR made another big call a minute later, adjudging that home defender Jaouad El Yamiq had brought down Pellegri in the box. It seemed apt that former Genoa prospect Pellegri should take the resulting penalty, which squirmed underneath Ionut Radu to put us 1-0 up. The ever-excellent Chiesa created some great opportunities to double our lead after the restart. Alas, Eysseric struck the post in the 54th minute, four before Pellegri sent a chip over the crossbar. Genoa hit the woodwork themselves midway through the half, with Lafont’s bar keeping out Piatek’s header from Iuri Medeiros’ corner. The Grifone grew in confidence in the closing stages, thanks in part to us losing Eysseric to an ankle ligament injury. Teenage forward Eddy Salcedo and veteran defender Ervin Zukanovic each threatened our lead, as did the unlucky Piatek, but we clung on for dear life and emerged victorious. Milan returned to 1st position by beating Atalanta 2-1 while Inter toiled to a draw at Bolgona. Napoli also returned to winning ways at home to Pescara, while the derby between Juventus and Torino finished 1-1. 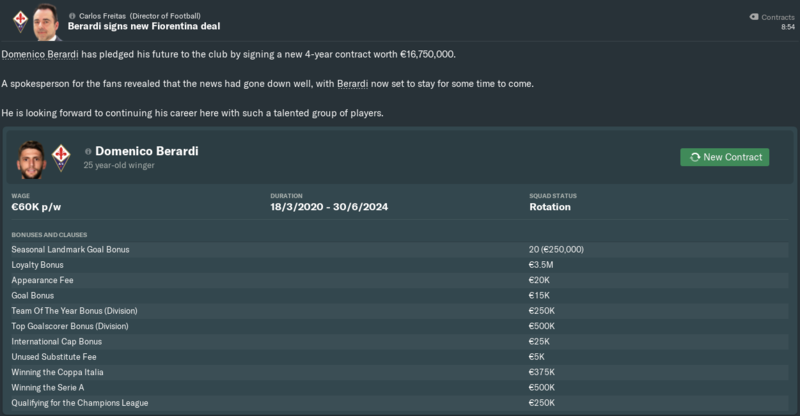 About a month ago, Berardi started asking me for a pay rise. 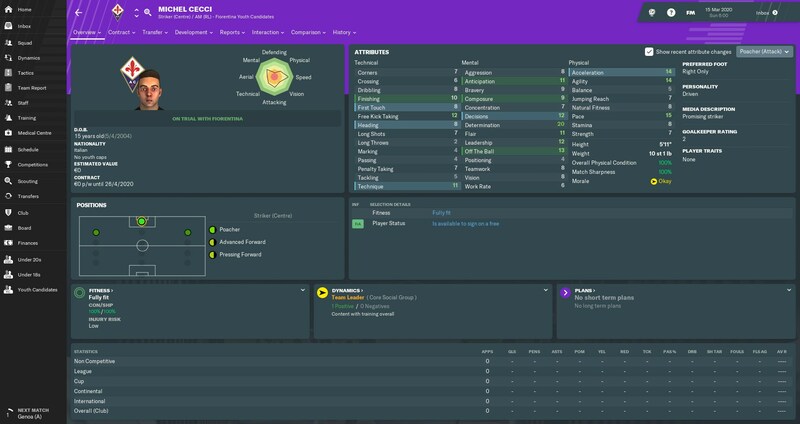 I was initially reluctant to budge, as it’d not even been a year since he’d joined us from Sassuolo for €40,000 per week. This still seemed reasonable, as Domenico’s Viola career had thus far consisted of him scoring a load of penalties and not doing much else to justify the hype (which I guess made him our Mario Balotelli). Berardi went off on a sulk, and as his training performances plummeted, so did his first-team chances. Despite a few complaints from other players, I stood my ground. He could moan all he liked, but he wasn’t getting a new deal. Eventually, though, I relented. When a press report claimed that Berardi was on the verge of requesting a transfer, I decided that a player with his creativity – not to mention his prowess from 12 yards – was not worth losing. I thrashed out a new deal with him and his agent during the international break, before things could get out of hand. Good to have that sorted. Just don’t ask me for another new contract next season, Domenico, because I won’t be quite so generous next time. Berardi celebrated his pay rise with another trademark party, and Olivera had one of his own after scoring on his senior international debut for Uruguay. Milenkovic also broke his duck for Serbia, and Antonsen received a first Under-21s cap with Denmark. The last team to beat us at home were Lazio, back in mid-January. Now it was their bitter rivals’ turn to try and silence the Franchi. Roma did not look like a team capable of achieving that, as they were badly underperforming in mid-table and still trying to find their feet under new manager Francesco Guidolin. We headed into this Friday night match without our first-choice right-back Almamy Touré, who was still on international duty with Mali. Our second-choice Kevin Diks lasted just seven minutes before colliding with Stephan El Shaarawy and spraining his ankle ligaments. That meant Milenkovic had to come off the bench to deputise. Despite that, we spent almost the entire first half camped in Roma’s half, creating chances with great regularity. Giallorossi keeper Etrit Berisha looked unbeatable until five minutes from time, when Chiesa hammered in a delightful through-ball from Pellegri. I thought Federico was marginally offside at first, but VAR confirmed the goal. Our two main goal-getters continued to cause Roma problems after the break, and we had several opportunities to go 2-0 up before eventually doing so on 65 minutes. Chiesa matched Pellegri’s club-best record of 14 goals this season, smashing a free-kick in off the bar after Benassi had been upended by Javier Pastore. Chiesa couldn’t quite make it a hat-trick, but his double would be enough to earn us victory… just about. In the 89th minute, Milenkovic seemed to think Lorenzo Pellegrini was wearing a purple jersey, as he telegraphed a sloppy throw to the Roma midfielder. The ball was quickly moved forward to El Shaarawy and then Pastore, who chipped Lafont to pull one goal back for the lacklustre visitors. Milan retained a two-point lead by narrowly beating Salernitana, but their title rivals kept the heat on them. Inter prevailed by the same 1-0 scoreline at Empoli, while Napoli were more convincing in putting three goals past Bologna. Lazio’s five-star performance against Chievo left them just two points off 4th-placed Juventus, who drew a dull match at Udinese. Torino succumbed to a home defeat against a resurgent Cagliari, which meant we regained 6th spot with eight games to go. Can we keep hold of our top-six place? Can we upset Inter and prolong our Europa League dream? Come back soon to find out! This entry was posted in FM19, Shades of Deep Purple and tagged Fiorentina, FM19, Football Manager 2019 on 21 November 2018 by Chris Fuller.